UNITED NATIONS, Apr 27 2015 (IPS) - Against the backdrop of a new Cold War between the United States and Russia, two of the world’s major nuclear powers, the United Nations is once again playing host to a four-week-long international review conference on the Nuclear Non-Proliferation Treaty (NPT). A primary focus of this year’s conference, which is held every five years, is a proposal for a long outstanding treaty to ban nuclear weapons. “Eliminating nuclear weapons is a top priority for the United Nations,” Secretary-General Ban Ki-moon told delegates Monday. “No other weapon has the potential to inflict such wanton destruction on our world,” said Ban, who has been a relentless advocate of nuclear disarmament. He described the NPT as the cornerstone of the non-proliferation regime and an essential basis for realising a nuclear-weapon-free world. Dr. Rebecca Johnson, director of the Acronym Institute and former chair of the International Campaign to Abolish Nuclear Weapons (ICAN), told IPS: “If we rely solely on the NPT to fulfil nuclear disarmament, we’ll have a lifelong wait, with the ever-present risk of nuclear detonations and catastrophe. “That’s because the five nuclear-armed states treat the NPT as giving them permission to modernise their arsenals in perpetuity, while other nuclear-armed governments act as if the NPT has nothing to do with them,” she added. 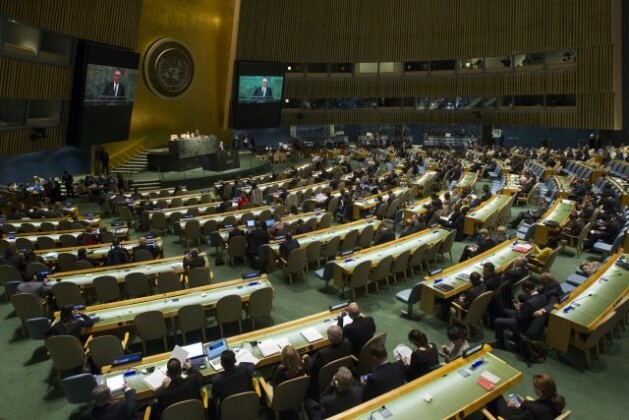 A next-step nuclear ban treaty is being pursued by ICAN’s 400 partner organisations and a growing number of governments in order to fill the legal gap between prohibition and elimination. Expressing disappointment over the current status on nuclear disarmament, the secretary-general pointed out that between 1990 and 2010, the international community took bold steps towards a nuclear weapon-free world. There were massive reductions in deployed arsenals, he said, and States closed weapons facilities and made impressive moves towards more transparent nuclear doctrines. “I am deeply concerned that over the last five years this process seems to have stalled. It is especially troubling that recent developments indicate that the trend towards nuclear zero is reversing. Instead of progress towards new arms reduction agreements, we have allegations about destabilising violations of existing agreements,” he declared. Over the weekend, Peace and Planet Mobilization, a coalition of hundreds of anti-nuclear activists and representatives of non-governmental organisations (NGOs), delivered more than eight million petition signatures at the end of a peace march to the United Nations. The president of the Conference, Ambassador Taous Feroukhi of Algeria, and the United Nations have received several petitions from civil society organisations (CSOs) calling for the successful conclusion of the current session and negotiations for the total elimination of nuclear weapons. But the proposal is expected to encounter strong opposition from the world’s five major nuclear powers: the United States, Britain, France, Russia and China. According to the coalition, the weekend began with an international conference in New York attended by nearly 700 peace activists; an International Interfaith Religious convocation attended by Christian, Muslim, Buddhist, Jewish, and Shinto religious leaders; and a rally with over 7,500 peace, justice and environmental activists – including peace walkers from California, Tennessee and New England at Union Square North. “Recognising the deep flaws in the NPT, we see the importance of a strong civil society presence at the 2015 Review Conference, with a clarion call for negotiations to begin immediately on the elimination of nuclear weapons,” said Jackie Cabasso of the Western States Legal Foundation. “We also recognised that a multitude of planetary problems stem from the same causes. So, we brought together a broad coalition of peace, environmental, and economic justice advocates to build political will towards our common goals”, she said. The Washington-based Arms Control Association said rather than the dozens of nuclear-armed states that were forecast before the NPT entered into force in 1970, only four additional countries (India, Israel, Pakistan, and North Korea, all of which have not signed the NPT) have nuclear weapons today, and the taboo against the use of nuclear weapons has grown stronger. The 2015 NPT Review Conference provides an important opportunity for the treaty’s members to adopt a balanced, forward-looking action plan: improve nuclear safeguards, guard against treaty withdrawal, accelerate progress on disarmament, and address regional nuclear proliferation challenges, the Association said. However, the 2015 conference will likely reveal tensions regarding the implementation of some of the 65 key commitments in the action plan agreed to at the 2010 NPT Review Conference, it warned. Though the United States and Russia are implementing the 2010 New Strategic Arms Reduction Treaty (New START) accord, they have not started talks on further nuclear reductions. “Russia’s annexation of Ukraine will likely be criticized by some states as a violation of security commitments made in 1994 when Kiev joined the NPT as a non-nuclear-weapon state,” the Association said. At the same time, most nuclear-weapon states–inside and outside the NPT–are modernising their nuclear arsenals. This is leading some non-nuclear-weapon states to call for the negotiation of a nuclear weapons ban even without the participation of the nuclear-weapon states; while others are pushing for a renewed dedication to key disarmament commitments made at the 2010 NPT Review Conference, the Association argued. Ban said the next few weeks “will be challenging as you seek to advance our shared ambition to remove the dangers posed by nuclear weapons”. This is a historic imperative of our time, he said. “I call on you to act with urgency to fulfill the responsibilities entrusted to you by the peoples of the world who seek a more secure future for all,” he declared.